Not at Blooms and Berries! Once you pay to get in, you’re free to enjoy nearly everything there at no extra cost! And believe me, there’s plenty to keep you busy all afternoon long. But they also have a big version that you can spend 30 to 45 minutes wandering through. You’ll have a mystery to solve, so make sure you find all the clues! You can take strollers through the maze. They’ll fit, but you’re nearly guaranteed to pick up some mud along the path. This is a farm, after all! We’re lucky enough to have goats and chickens at home. But that doesn’t mean we don’t love to see them other places, too! We were able to also see donkeys, turkeys, and other fun farm animals. 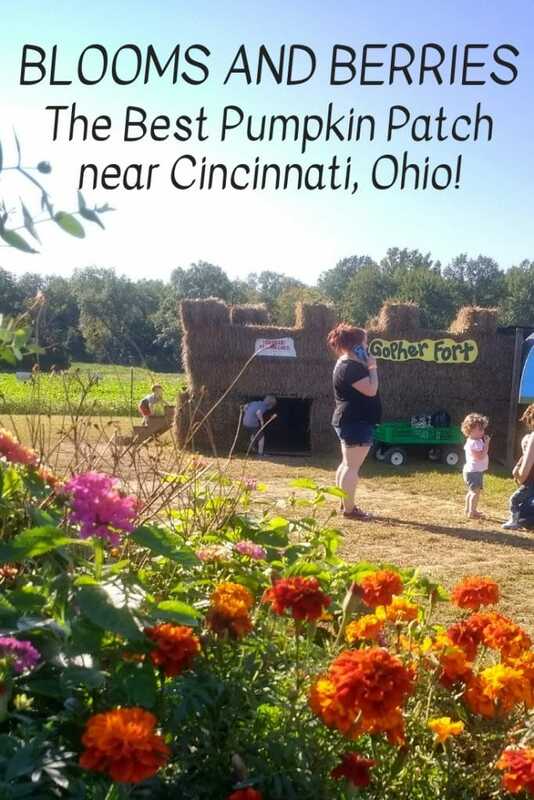 These photos show you only some of the fun activities your kids can enjoy during Blooms and Berries Fall On the Farm! It’s a beautiful place to let your kids run and enjoy themselves on a fall afternoon. Fall in Cincinnati means you could be feeling summery on Saturday…and rubbing up against wintertime temps on Sunday. But don’t worry, because you’ll find the right treat for any weather! I passed up the temptation to try the apple cider float this time (baby #6 isn’t liking dairy right now…pout!). Get a coupon for $2 off any Monday through Friday trip. Our family loves to head to Blooms and Berries on one of those random “teacher in service” types of days off of school. We always love the smaller crowds… and with this coupon, now it’s even more affordable! Don’t let fall fly by without enjoying Blooms and Berries Fall On the Farm!! This fall tradition is a family favorite in our house…and will soon be in your’s, too! Next…don’t miss these awesome Easy DIY Halloween Decorations for your home!